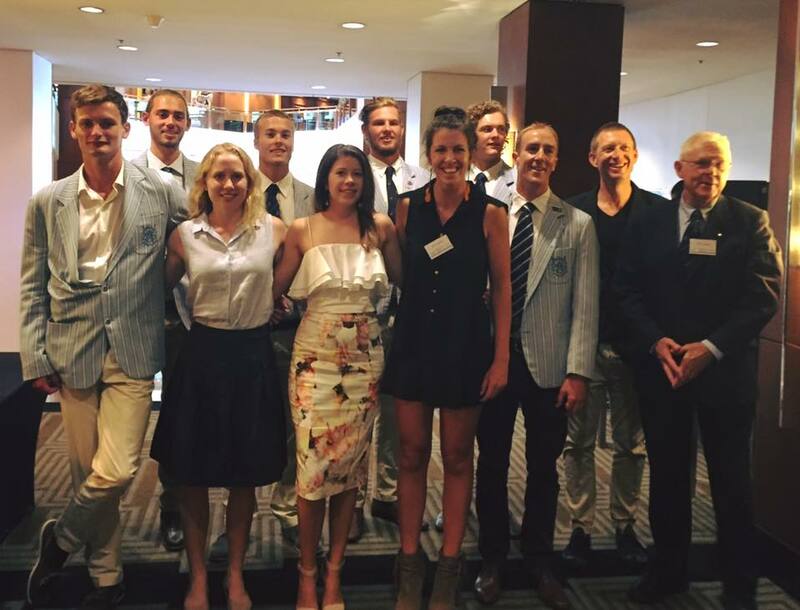 Sydney Rowing Club was well represented at the annual King’s and Queen’s Cup Luncheon held at the Four Seasons Hotel, last Friday with eleven athletes and two coaches named in the 2016 NSW State Team. The event began with a minute’s silence to honour the life of Sarah Tait, one of Australia’s most successful oarswomen both on and off the water. Lizzi Chapman gave a touching tribute to Sarah’s rowing achievements and strength of character as a role model and leader within Women’s rowing. In a change of tone, the entrée of smoked salmon and salad accompanied the address from rowing historian, Andrew Guerin in which he detailed the rich history of the King’s Cup. The history of the event was no doubt inspiring and perhaps provided a glimpse into the future for the four SRC members who will contest the Noel F Wilkinson Cup (Men’s youth eight) in their first interstate team. As the afternoon rolled on, the main of scotch fillet and potato gratin was served while highlights of last year’s interstate regatta underlined the strength of the New South Welshmen and Women and their passion and determination in racing for their state. After a brief topping up of refreshments, King’s Cup veteran James Chapman together with Queen’s Cup coxswain Kendall Brodie were invited onto the stage to draw lanes for their respective races. It was sheer good luck that both the King’s and Queen’s Cup were drawn in lane 5, an ideal position to be in in such a race. Wearing his NSW honour Blazer, Chappo took the opportunity to call upon this years NSW State Team representatives to reflect on what it means to wear the Waratah on race day as well as giving an insight into the winning streak of the NSW King’s Cup crew. Kendall spoke from a coxswain’s perspective on how the interstate race differs from any other race and how she brings her crew together. Kendall is looking forward to the regatta following the strength displayed by this years Queen’s Cup crew and the promise of an exciting race. The afternoon was capped off with a delightfully fluffy meringue dessert and lots of eager discussion around which states are looking strong this year. We wish all of the NSW athletes the best of luck in The Interstate Regatta to be held on 20 March at the Sydney International Regatta. As the dutiful barbecue loitered in the shadow of the boathouse and the annual Bay Run thundered past, the novices got to work. With many racing solo for the first time in their fledgling careers, they assembled bright and early by Leichhardt Rowing Club. Undaunted by the stampede of joggers marauding through the congregation, they launched from the pontoon into the strange and wonderful world of competitive racing at the Leichhardt Regatta. The odds were in Sydney’s favour for the first novice heat with 80% of the line-up toting the light blue zootsuit. Our furtive foursome battled all the way down the course and left the sole Central Tablelands representative wallowing in their wash; Tal “Smokin’” Lewis finished fourth, with Evan “Colorado” Wang in third, Oscar “Ends” Gullickson as close second and Alexander “Migdanamas” Migdalias in first place. Although facing a winning duo from Central Tablelands and St. George in the second heat, the Sydney novices still defied each other as they defied the course. Young ‘uns Bradley “Family Man” Deng and Adrian “Grape” Castillo finished in close third and fourth with Rahel “Ironfam” Sahni placing fifth to trump the unsuccessful Penrith presence. Not long after came Lucas “Crack” Chabo who achieved an honourable third in his D Grade scull. The following A/B double snagged the second win of the day as Lloyd “Broken” Caetano teamed with a local Newington coach for a whopping final push past Rodd Island. He soon moved up a boat size to take out second place in the C quad scull, marred only by a post-start disparity between bow seat and his presence upon it. 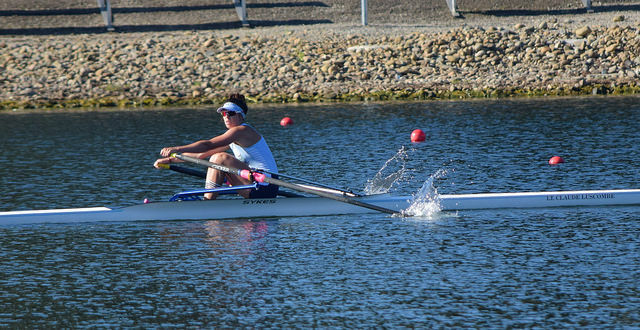 Kisha “Prep” Chabo served in her first D Grade scull and ranked a hotly contested fourth, displaying remarkable concentration for such a newcomer to competitive regattas. The A/B scull, stretching from beyond Iron Cove Bridge to past Rodd Island, had some new faces in the start – three young rowers who were racing up a division to tame the dreaded 2000m. Accompanied by the more mature Lloyd Caetano, they challenged the entrenched boyars of this event. Cristian “Orange” Pezo kept pace with his competitors almost to the finish and allowed the aforementioned Lloyd to rank third. In the second heat saw Ben “Mumford” Brenner have as fun a race as he predicted on the start line, while John “What-A-Head” Bivell held forth against a boat whose fin had been unceremoniously savaged by a tree en route to the event, creating all manner of directional intrigue down the course. The return of the novices spiced up the atmosphere one again – finally, another chance to prove their mettle against the big boys of the regatta. Oscar, Alex, Rahel and Adrian came fourth after some solid rowing upon the bay – ditto the second crew featuring upcoming athletes Bradley, Tal, Evan and Lucas. Both boats exceeded their expectations and showcased proudly the skills honed over the summer holidays in the shadow of Sydney Rowing Club. With a job well done, they loaded their boats and retired from the event. The regatta slowly eased into the afternoon – CHS hopefuls from Sydney Secondary College Ben and Tal pulled a cheeky third in the D double – aside from one major upset involving a Concord High double, a five boat length lead and an oar that attempted escape velocity. Pleased with a fine day and an even finer barbeque from the hosts, the junior janissaries of the Parramatta River loaded the trailer and hit the road. The Club’s annual regatta was held last weekend and, with the State’s elite athletes taking some time off following the grueling trial process of the previous seven days, nurse the regatta was a relaxed affair this year. A big contingent of members made the trip west to support the club and enjoy some quality racing action. Cloud cover and a light southerly breeze made for temperate conditions at SIRC for the 2016 SRC regatta. Throughout the boatpark there were constant reminders of the national selection trials of the past week, with evidence of RA and ASADA testing visible at every turn. With selections finalised for most boat classes on Friday, there was much discussion of the fates of the nations top rowers as the volunteers assembled for morning duties. Who would make up the four? What of the lightweights? Would Tonks be parachuted in to coach the eight? Such questions were soon forgotten as racing commenced and new heroes were being crowned. The first winner for SRC was Lloyd Caetano, who overcame a sluggish start to eventually take the lead in the under 19 single at around the 1500m before racing away for a 2 length win. While Lloyd is Canada Bay born and raised, the next Sydney winner was a recent arrival in Harriet Hudson. Harriet has migrated to Sydney from Queensland for tertiary studies and has been naturalised into the Carter stable. Her win followed success at the State Championships last week and a strong showing at the Nationals is anticipated. A big field was assembled for the para single and Sydney’s Erik Horrie chalked up another win as he continues his preparations for Rio. Senior public figures in attendance watching the race included the Mayor of Penrith, the member of the legislative assembly for Drummoyne – John Sidoti, and Canada Bay Council Sustainability Committeeman Norbert Brenner. Coach Baker also had a large group of under 21 athletes racing in what for many was their final regatta of the season as University starts this week. Among them Charles Patterson, Bob Wells, Hugh Courts, Henry Kamp and Hamish McDonald are members of the recently selected State Youth Eight which had a comfortable win in the open eights event. Fresh from hearing the news that masters rowing is to be added to the program for the nationals this year, the elder statesmen and women of the sport were champing at the bit ahead of their races. For Sydney this of course meant the legends would be taking to the water, but there was tough competition for the club’s senior eight. A rival crew featuring top masters oarsmen Mike Burgess and John James were widely favored to win the event, but the legends were able to overcome a hefty handicap to hit the front in the shadows of the judges tower and get home by a canvas. The final race on the program was one of the most exciting, with Georgia Bradley teaming up with Crystal Piper from Lower Clarence to race in the under 19 double. Having led from the start, the girls were rowed down by a resolute Leichhardt pair in the last 250m to be relegated to 2nd. Even this disappointment could not temper the high spirits of members in attendance, who enjoyed fine hospitality during the day including refreshments from the club bar and locally sourced prawns. Thanks must go to all the volunteers and supporters for the event, including those from other clubs that continue to patronise Sydney’s regatta and contribute greatly to its ongoing success. The NSW State Champs, the traditional lead up event for the Sydney Rowing Club Regatta, was held at SIRC from 12 – 14 March. With National Team selectors swarming upon Penrith in unprecedented numbers, the stakes were high. While not reaching the heights of last year’s state champs, SRC nonetheless had a solid regatta with a few standout performances. Tensions were high as the State champs kicked off on Friday. On the surface the boat park was a typical scene of preparation, boats being rigged, muscles being activated, coaching being broadcast. But to talk to the athletes, the occasion was clearly more muted than the normal celebration of rowing that this event marks. The spectre hanging over the participants was that of the Rowing Australia bureaucracy, which had taken over SIRC for the week and was monitoring the movements of all senior A players closely. With the fruit hats of Rio close enough to taste, now was the time for national team aspirants to show off their wares to eager spectators in the SIRC grandstand. Josh Hicks and Leah Saunders raced in selection events, finishing 2nd and 4th respectively. Also in the single was Chris Morgan, who came 5th in the A-Final of the championship event, just 4 seconds behind the winner Sasha Belonogoff. 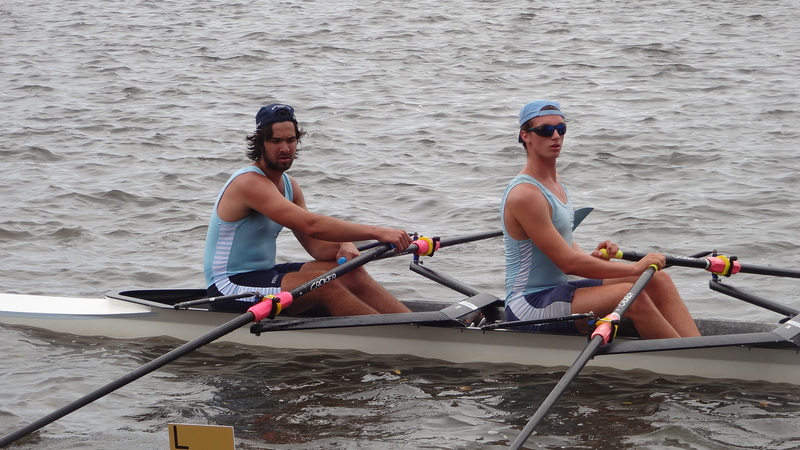 All eyes were on the men’s pair event on Saturday, with a big Sydney contingent engaged. In the final, Turrin and Lloyd were upstaged by Bill Lockwood and Lex Hill of the Canberra National Training Centre of Excellence. James Chapman and Nick Purnell continued their blossoming relationship, improving into 4th place after a slow start. The overall race was very close with only a few lengths between first and last so the signs are good for a potential tilt at qualifying the men’s eight. With the focus of the senior squads on national selection, it was the club’s development athletes that took centre stage at this year’s championships. In particular the under 19 category proved rich pickings for SRC, with Harriet Hudson winning the women’s scull and Max Brenner placing 3rd in the men’s event. Both events attracted the very best athletes from around the country so both results auger well for Harriet and Max’s chances at the Nationals in March. Also competing for Sydney in the under 19 category were a group of Shore boys coached by long-time friend of the club, Dave Jennings. The lads were up against fierce competition in all lanes during the quad and double event and the chances of success looked slim. Dave, a history teacher by trade, was undeterred and delivered a rousing pre-race address based upon the Battle of Rorke’s Drift. The crews went on to triumph in both races in slashing style. The main event on Sunday was the champion eights of NSW. The marquee event of the regatta, the champion eight calls for men of strength, honour, dignity and piety. Alas, for SRC no such men could be found and the club did not boat a crew to defend last year’s hard fought title. This left the spoils of the QL Deloitte Trophy to the hands of the Victorians; with Sydney’s sister club Mercantile taking the win. The women’s eight was won by Melbourne Uni comfortably ahead of UTS and St George. The lightweight squad should not be forgotten. While there were no Simon Nola’s or Hugh McLeod’s racing in the light blue over the weekend, the men’s four of Bladen, Parcsi, Farthing and McDonald performed soundly to claim the bronze medal in a competitive field. Other notable mentions go to Charlie Patterson who continued his breakout season with a silver in the under 21 scull and Romy Davenport who raced in a couple of successful composite crews. The gods of Iron Cove were smiling fondly on this auspicious date, blessing the rugged bay of Iron Cove with surprisingly smooth water and favourable conditions. It was with this celestial approval that the junior jousters of Sydney Rowing Club entered the annual Balmain Regatta. For many, it was their first time, freshly minted rowers nervous but eager to test their blades with that of the enemy. For others, this was history; a chance to settle old scores, chasten ancient rivals and finally win that one race that they so would have won last year, if only that one guy hadn’t pushed them off the course. With an admixture of youthful enthusiasm and salty vengeance, Coach Paul “Obama” Coates assembled his protégées by Leichhardt shed. First up were the novice scullers. They had trained hard through the summer holidays, applying themselves diligently to the oars. Now, it was time to put them to the test, and they performed to their utmost. Evan “Legit-63” Wang and Oscar “Deckchair” Gullickson finished fifth and sixth, gaining valuable experience from their maiden regatta. Meanwhile, Alexander “Brownies” Migdalias, despite a smattering of self-professed crabbing, placing fourth in his novice single scull. Following this heroic effort of donning the blue spandex for the first time came the D grade single sculls. Benedict “Beanie” Brenner had his start unfortunately sabotaged by a passing plane, but nevertheless fought past this aural adversity to come fourth in his race. Additionally, John “Juggler” Bivell came first in his D single over Glebe and Sydney Women’s. The real stand-out of the day came in the lethargic recess preceding the boys’ quads, as the young Keesha “Exploratory” Chabo won an astounding victory in her novice women’s scull. In second place at halfway and facing a Penrith adversary behind and in front, she executed an extraordinary final 500m push that saw her overtake the orange caps to win the very first race of her career. Her elder brother Lucas “Dad” Chabo also participated at the Balmain Regatta, ranking fourth place in his D single scull. At last, the long wait was up. After a strenuous interregnum, the final combatants arrived, one swaggering in his light blue apparel for the first time: Cristian “Tinkler” Pezo, who joined the D scullers in the Dallas Smith quad; and Rahel “Captain America” Sahni, who stripped off his superhero t-shirt to join the novice rowers in the Larry Parker. Both crews had an excellent warm-up to Iron Cove Bridge and executed some killer starts in preparation. With the blood pumping in their ears and the Larry still favourably above sea level, each crew took off. Cristian’s boat ranked third in their heat, unable to match the springy St. George or wizened Sydney Women’s. The novice quad also performed admirably for their first crew race in third, their experience and racing spirit fermenting well in the competitive environ of the Balmain Regatta. With the day’s work done, the crew began to pack away the trailer. The afternoon was livened considerably during Cristian’s C grade single scull, where he managed to keep pace with a cohort of rowers well above his division. With such a feel-good air fermented only by the breaking of new rowers to the wonderful world of regattas, they convalesced homewards, taking a couplet of black-and-yellow medallions and some fond memories with them from the waves and waterfront of Iron Cove. The Small Boats Regatta is always a major selection event as athletes return from summer training for the first major competition of the New Year. This year, however it wasn’t just NSW coaches cycling the banks of SIRC, as national team aspirants were required to race in advance of the official selection event in a few weeks’ time. SRC coaches: Don Cech, malady Lachlan Carter and Jason “JB” Baker. Sydney has a number of athletes in contention for national team selection and, depending on Rowing Australia’s decision with respect to eights qualification, the men’s heavyweight sweep squad looks likely to hold the greatest SRC seat potential for Rio 2016. Sydney’s contingent has had a divergent preparations over the summer, with some at the National Training Center of Excellence in Canberra and others at the club’s camp in the Southern Highlands, while James Chapman trained with new partner Nick Purnell on the Manning River and its tributaries. The incumbent pair of Turrin and Lloyd were clear winners in the elite pair, finishing over a length ahead of the experienced Victorians Josh Dunkley-Smith and Josh Wilkes-Booth. Just behind the hyphenated pair were SRC’s Hicks and Moore, leading some to hypothesise that selectors may opt for a Joshua three in the national team. Also making the A-final were the vestal combination of Chapman and Purnell, a satisfying result for their first time together. In the single events, Leah Saunders finished 3rd in the C Final and Chris Morgan continued his encouraging form with a third place in the A final won by young Sasha Belonogoff of Sydney Uni. Morg’s time of 6.57, while unremarkable on paper, was very sound given the tempestuous conditions in Penrith on the day. Ultimately the storm front moving from the West resulted in the cancellation of the afternoon racing, but not before the Sydney under 21 squad delivered an impressive set of results in the singles and pairs. With State Youth eight selection soon to be decided, this was a timely performance from Coach JB’s squad of young lads. This week we catch up with one of SRC’s best performed athletes over the last few seasons, Leah Saunders. With national selections set to be determined over the coming month, it’s no surprise we met Leah on her way to training at the Club. Waiting for the 504 bus from Drummoyne to Abbotsford brings into acute focus the failures of man. While the current vanguard speak of disruption – the phrase du jour of the MBA set – the promise of revolution is yet to materialise in the core public services. For the huddled masses of the Victoria Road bus shelter this predicament has reached a desperate nadir. Having arrived with hope and expectation of a timely arrival, the diverse group is now unified in silent prayer to an unnamed deity with whom alone rests the power to carry them home. The timetable, that ten minutes ago was revered, is now keenly avoided lest its wanton heresy provoke an ill reaction from the god of transport. Hope stirs. Lurching towards the stop is an unmistakably formless Sydney bus. It travels north on the new river crossing, which curves coquettishly into Iron Cove in stark contrast to the efficient symmetry of the old bridge alongside. The would be patrons lean forward with heady expectation, even the children can sense the excitement of the moment and their cries are subdued. The winning numbers come into view – 506: North Ryde. The lucky few leap forward and clamber for position, once comrades, now rivals for the first steps of security as the doors open. The driver has a lean and hungry look. Bearded, he stares ahead unblinking as a few likely residents of the Gladesville projects board the 506. His visage speaks to atrophy of mind and spirit. As the defeated return to their pen, a new figure appears on the sidewalk, untroubled by the vicissitudes that have befallen the incumbents. It is the determined face of SRC’s own Leah Saunders. She is on her way to the club for a training session following a shift at work. Training for a seat in an Australian crew in an Olympic year is a high calling and her sense of purpose is in strong contrast to the others slumped in waiting about her. It is a truly difficult path to the honours that are sought, and Leah carries a heavy workload in pursuit of the goal. She has recently returned to Sydney following a national training camp in the Southern Highlands, where both sweep and sculling training has complemented gym and aerobic capacity building. As yet few clues have been forthcoming from the Rowing Australia bureaucracy as to what form the selected squad will take. A familiar question hangs over the eights, with neither the men’s nor women’s boat having secured selection. If the eight were to travel to Europe to seek selection, far greater opportunities would be available. For Leah, her highlights during the 2014/15 season were achieved in the sculling classes, so possibilities remain in the quad boat. The selection timetable is long and tortuous. Even now, there are many rivers to cross. An omnibus series will be conducted for aspirants at the upcoming Small Boats Regatta in Penrith, before the NSW Championships are used to reduce the squad for the Selection Regatta the following week. This follows untold official and unofficial tests of boat speed noted by officials over the quadrennial. The famed grand cru relies on both the quality of the grapes and the stewardship of the winemaker. Leah is on time and ready to depart, but whether the bus will come cannot be known. 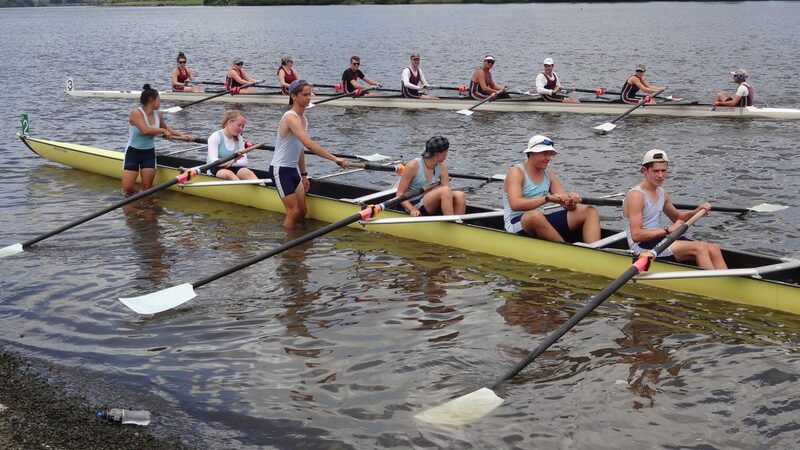 The annual Taree Summer of Fun Regatta is always a highlight for the athletes of SRC, as the best and the rest from around the state gather on the tempestuous Manning River. This year flood warnings had preceded SRC’s arrival, however as it eventuated the waters subsided and the only overflow evident was that from the Sydney cup of success. Day one of the Taree regatta was a wild affair. As always the initial marking of territory sparked controversy, as clubs sought to lay claim to prize tracts of land through various demonstrations of dominance. A foray from the Penrith club into the traditional acreage of the Balmain club led to the subsequent displacement of Leichhardt, Newcastle University and Glebe from their preferred positions causing much angst amongst the proletariat. Fortunately the gentry of SRC were as ever landed in the prime position thanks to the efforts of Captain Pauli Coates and Ray Armstrong. The impressive land and property holdings of Sydney, combined with a choice selection of labour inputs and strong entrepreneurial spirit saw the club perform to the extreme of its productive capacity once racing commenced. This was despite an early setback caused by the withdrawal of Hugh McLeod (back strain) from the A single, an entry those using the accrual method of accounting had already booked as an SRC win when the draw was released. Such disappointment was but a distant memory when the men’s B singles took the course, with the saturnine mood displaced by jubilant wins to Brenner, Goldstein and Giles. The mixed quads proved to be a swingers event, as Sydney notched couple of wins and a couple of defeats. Nonetheless all competitors left satisfied that they had thrown their keys into the ring and given it their best shot. Following the day’s racing the SRC contingent separated for the evening. Some gathered at Hugh McLeod’s new residence in Taree where a wholesome meal was provided, while others hit the Taree main street to enjoy its famous nightlife. Fortunately there were no reports of misadventure this year, perhaps due to some notable non-attendances amongst the touring party. Day two began with a flurry of Sydney wins, headlined by Richard Martin and Ken Ambler in the masters eight in a composite with the Mosman club. Mosman have long been the standard bearers for men’s masters rowing in NSW so it was a great opportunity for Sydney to share in their success. This marked the beginning of an incredible run of seven consecutive wins for the club, spanning the women’s B pair of Emily Partridge and Madison Brown to the men’s D grade single of Christian Pezo. This statistical anomaly would soon correct itself however, as the men’s open four suffered defeat after the unfortunate withdrawal of senior member Hugh McLeod (knee strain). The foursome of Fiona Martin, Deb Church, Kaye Smythe and Dorothy De George were a constant force over the weekend and had a dashing win in the quad on Saturday. The men’s masters’ squad received a rousing pre-race address from Dallas Smith, after which the double of Paul Coates and Andy Goldstein duly saluted. Perhaps the most exciting race of the weekend was in the men’s pair, where Stu McDonald and Jack Farthing rallied from 2 lengths behind at the 250 to finish over the top of Glebe. The lightweight pair of Gav Parcsi and Matt Bladen was close behind in 3rd. Following the completion of racing, the traditional whole of club barbeque was held on the course. As always this was a fine opportunity for athletes, coaches and supporters to share stories and contaminants over the braai. Gradually however the impending tariffs of the final days racing began to weigh on the mind and an early night was called. The final day of the regatta continued in much the same vein as the first two, apart from the weather, which turned far more pleasant facilitating greater use of the club recovery pool. The B quad of Sara McDonald, Brianna Caputo, Emily Partridge and Madison Brown were worthy winners in the morning, taking a comfortable 2 length margin over the Leichhardt club. Gav Parcsi then atoned for earlier defeats with a resolute win in the lightweight single. Unfortunately the spectre of injury again hung over the club as substitutions were required in Masters and Open grade quads due to the unavailability of Hugh McLeod (rib strain). In keeping with the latest directives from Rowing Australia, the SRC crews embraced this disruption and the replacements excelled at the new metrics of success determined – Kurtis Aroney anchored the open quad in its win, while Anthony ‘the magic man’ Mujic was conscripted from Newcastle Uni for a tour of duty in masters quad. As ever, the regatta was a great success and was much enjoyed by the entire Sydney contingent. Congratulations must go to Manning River Rowing Club and Rowing NSW for their outstanding strategic direction and client focused approach.